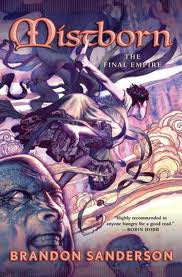 Why I read it: I had already read Elantris and loved it, and had heard great things about the Mistborn series. “Once, a hero arose to save the world. A young man with a mysterious heritage courageously challenged the darkness that strangled the land. So… what to say about this book? It was fantastic! One of the best fantasy novels I’ve read. I read Elantris, and really enjoyed it. But Mistborn blew my mind. Brandon Sanderson has created such an incredible, magical and wholly believable world. And the characters that he creates… They are so human. Wonderful characters that are so realistic and believable. Vin is now my favorite heroine. (If only I’d read this when I did my Top Ten Heroines list!) She is such a strong character. My friend described it well. Vin adapts. She goes through a TON of changes in a very short time and adapts to every situation she is put in. The storyline is strong and kept me enthralled from the first page until I turned the last page. I kinda knew where the storyline was going, but then there were twists thrown in that totally threw my predictions off. At one point I truly had no idea what was going to happen next (it was about this point that I was pulling the book out during my boring Health class and sneaking a few pages in while the professor wasn’t looking.) I like that Sanderson throws Religion and Politics into his novels without any hesitation. It adds depth to the story. This is the first book in the trilogy, I plan on reading the next one very soon. (After I finish my 4 essays, ASL test, two class presentations, a bunch of assignments for my Business class and read a half dozen of Shakespeare’s Sonnets. Why must something like school get in the way when there are books to be read?) Anyway, AMAZING book. I just noticed that too...I can't take credit for this! Sorry guys. I was doing this from my phone because I was at my little sister's cross country meet. Sounds like a great book! I'll have to make note of this one. Great review, and good luck with all of your assignments. This one is already on my to-read list, I'm so glad you liked it! I really enjoyed Elantris and hope to love this one as much as you did. Great review! I loved this book so much, too! Yet I haven't read the second book, but I really should. Mistborn was easily one of my favorite fantasy novels, ever. So glad you gave this book a try. Brandon Sanderson does not disapoint in his books. :) You will enjoy the rest of the trilogy too. :) And maybe give Warbreaker a shot too. :) Enjoy!